This farmhouse in Cornwall, England was recently restored and repainted by Alan Iles. After cleaning and repairing the render, the task of repainting it was tackled and usually this would have been a lengthy and laborious job. The bare patches would have needed to be primed either with primer or thinned masonry paint and in addition the unstable render would have needed to be treated with a stabilizing solution. 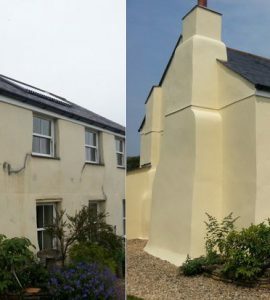 However, Alan knew that using Owatrol Easy Bond would make life much easier as, when added to the first coat of exterior masonry paint it acts as a stabilizer as well as penetrating deep into the surface to firmly bond the first coat of paint to the substrate, thus eliminating need for primer. There are many products & additives to aid the professional painter & decorator in their work, and consistently the company who supplies products that work exceptionally well are Owatrol. The product that helped us immensely in this project was an additive called Owatrol E-B. The E-B (Easy Bond) when mixed in with paint changes the paint’s formulation to become a superb bonding primer. We added the recommended amount of E-B to the Farrow & Ball Masonry Paint. Using rollers and brushes the first coat applied beautifully and swiftly. We were very pleasantly surprised how well the paint covered, compared to using masonry paint without any secret ingredient as a first coat. Alan was then able to add a second coat without Easy Bond to provide excellent coverage and he finished with a third coat for extra durability. The farmhouse looks great now and we’re pleased to see another happy Owatrol customer! Owatrol Easy Bond is perfect for creating an excellent finish on exterior rendering renovations, especially where the surface is unstable, porous, chalky or if there are large areas of bare render. You can of course also use it on a new project, with entirely bare render. This product is added to the first coat of exterior masonry paint to create an excellent stabilizer and bonding primer plus first coat in one. By using Owatrol E-B in this way you can greatly improve the coverage of the first coat and ease the second coat at the same time as eliminating the need for a primer!